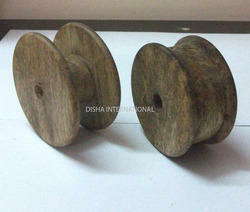 We are manufactures & exporter of Wooden Bobbins And Spools. We make these bobbins in different woods, sizes & shapes. We guarantee our product for a smooth finish & high polish to avoid entanglements of any thread, wool or ribbon. Any shape or design can be given shape to perfection as per buyer's specifications by our expert artisans of this trade. 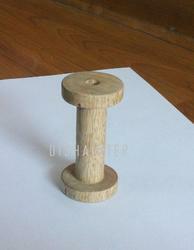 We are manufacturer and exporters of wooden bobbins and spools in all possible shapes and sizes. we manufacture these spools in various varieties of wood like mango, ebony, rose wood, rubber wood, kadam wood, teak, sheesham, surina and many more varieties. We produce these bobbins with brilliant smooth finish and polished to the perfection. we provide blind assurance to all buyers for delivery of quality products. You wouldn't get such quality and consistency anywhere in the world. Being a highly effective, lean and fast-moving organization, we are highly instrumental in providing an extensive array of Wooden Spool Bobbin. The offered bobbins are used in various industries for packaging purpose. Our provided bobbins are manufactured by our adept professionals using optimum quality wood and innovative technology. Furthermore, our clients can avail these bobbins from us in various sizes at reasonable rate. We are offering customized products. 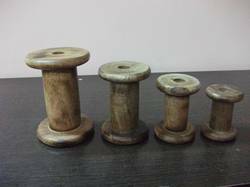 Our organization has successfully expanded its business in market owing to the offered elevated quality array of Wooden Bobbins. The provided bobbins are designed using excellent quality wood that is procured from the certified vendors of the industry. Our offered bobbins are made available in different sizes and dimensions for our customers. 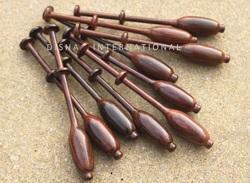 Apart from this, these bobbins are made in different woods and colour as per buyer's specifications. We assure that each bobbin or spool has smooth edges to avoid entangalment of thread, wool or ribbon. We also offer customized bobbins. 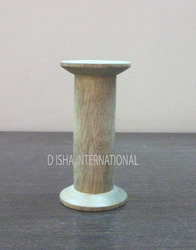 With firm commitment to quality, we are presenting for our clients a vast range of Wooden Bobbin Spool. The offered spools are manufactured using the finest quality wood and advanced technology by our adroit professionals. Further, our team of quality analyzers closely inspects these spools in order to remove any kind of flaw. Moreover, customers can avail these spools at affordable price. We are offering customized products. 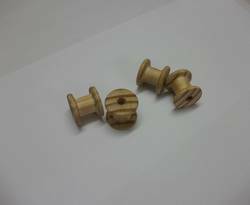 With the extensive knowledge and experience in this respective domain we are engaged in offering high quality Wooden Bobbins that are designed according to set industry norms. The offered bobbins are manufactured from superior grade wood with the help of sophisticated technology by our adroit professionals. Provided bobbins are checked by quality experts on well-defined quality measures in order to ensure their quality. Moreover, these bobbins are used for packing of threads in various industries. We are offering customized products. Packaging Details: Each spool will be packed in individual plastic bags. We are ranked amongst the foremost firms that is engaged in manufacturing, exporting and supplying a wide range of Wooden Bobbin. Our offered bobbin is manufactured by using the finest quality wood and innovative techniques from our experienced professionals. Apart from that, provided bobbin is extensively used in several cable industries for the wire winding purpose. Moreover, this bobbin is tested by our quality experts as per the market standards. We are offering customized products. 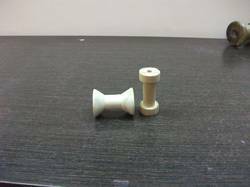 we manufacture these LACE BOBBINS in various varieties of wood like mango, ebony, rose wood, rubber wood, kadam wood, teak, sheesham, surina and many more varieties. Packaging Details: Packed individually or bulk packed. 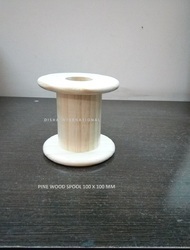 we manufacture wooden bobbins and spools for winding soft and silky ribbons or wires or any expensive material. Our spools are made with very fine and smooth finish to be a perfect match for silky materials. Competetively priced, these spools are a must for knitting industry and event managing companies. 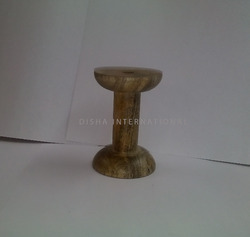 Any size of spool in any wood in any kind of finish can be made as per buyer's specifications. Manufactured adhering to the international quality standards, this plastic spool is highly demanded in the market owing to its superior quality features like dimensional accuracy, flawless performance and high tensile strength. This plastic spool is tested on defined parameters to ensure flawless finish and longer service life. 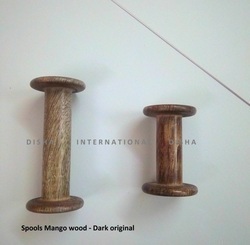 Owing to a long-term destination for our business, we are engaged in offering a wide gamut of Wooden Bobbins & Spools. The offered spools are manufactured using the best quality wood and contemporary techniques in varied sizes for our clients to choose from. Our provided spools are tested on predefined parameter so as to deliver defect free range. Moreover, clients can avail these spools from us at nominal prices. We are offering customized products.